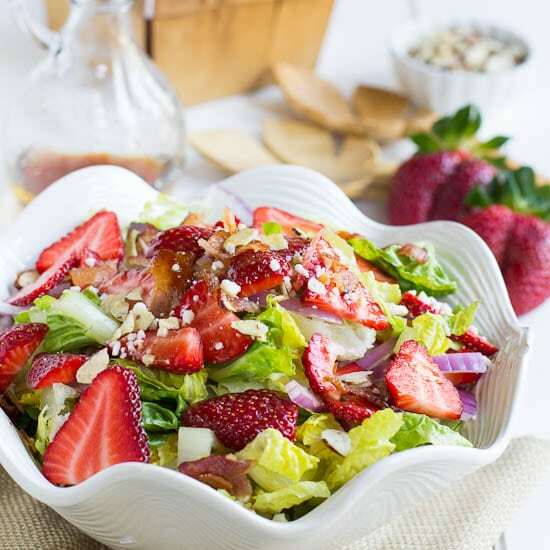 This Strawberry, Bacon, and Feta salad is full of contrasting flavors and textures. The strawberries add sweetness while the bacon and feta add saltiness. There are still a few strawberries left in the strawberry fields near our house, but they won’t be available much longer. They are some of the most juicy and delicious strawberries I’ve ever had, left on the vine until perfectly ripe. They’re so ripe they only last a day or two after picking and that’s OK because they get gobbled up pretty much right away. Since we have access to such great strawberries this time of year, we try to eat them as much as possible. We make cobbler, pancakes, shortcake, and sweet rolls with them. 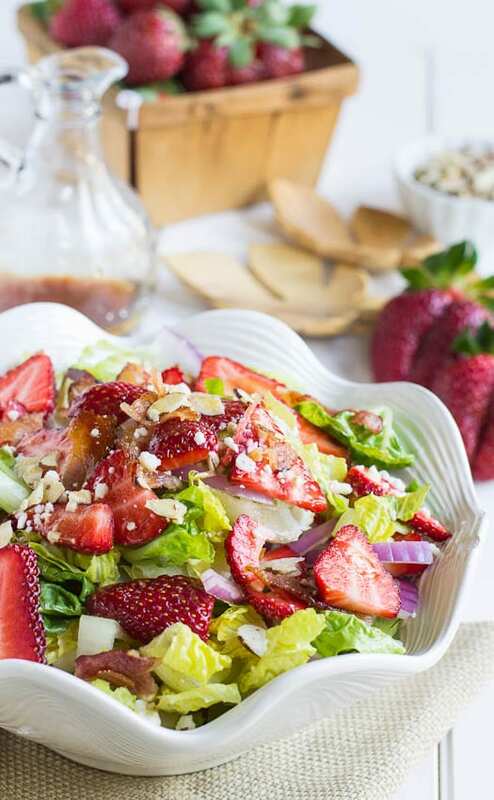 One of my favorite ways to eat strawberries or any fruit is in a salad. That didn’t use to be the case. As a child I couldn’t stand the thought of any fruit in a savory dish. I thought it should be illegal! But as an adult I think I may enjoy fruit in savory dishes even more than in desserts. 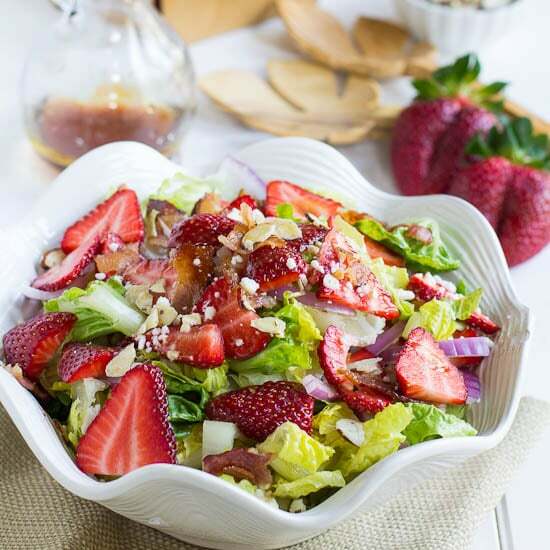 This salad is one of my favorite flavor combinations: sweet and juicy berries, salty bacon and feta cheese, crunchy romaine and almonds, and a dressing that is both sweet and tangy. It makes for a wonderful light supper! This spring salad is full of contrasting flavors. Plenty of sweetness from the strawberries and dressing plus lots of saltiness from the bacon and feta cheese. 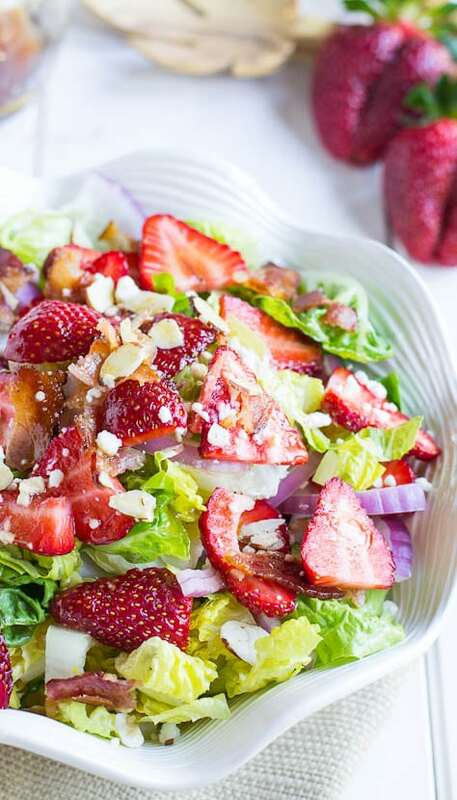 In a large bowl, toss together romaine, bacon, strawberries, red onion and feta cheese. To make dressing, whisk together all ingredients, except oil in a small bowl. Gradually whisk in oil. Sprinkle almonds on top of salad and drizzle with dressing. If you have a red onion that is especially strong, you can take some of the bite out of it by placing the sliced onion in a bowl of ice water for 15-20 minutes or so. This entry was posted in Salads and tagged bacon, Feta, strawberries. Bookmark the permalink. I can’t wait to go strawberry picking this year too. This salad is gorgeous with all the fresh berries – I love all the sweet and salty action going on in here, <3 this! I overbought strawberries this weekend, but I think this is happening this week! It took me a long time to warm up to fruit in savory dishes too and now I can’t get enough. I have yet to go strawberry picking …. I need to make it happen one of these days! This salad looks absolutely amazing – sweet, salty, it’s got everything going on! One of my favorite ways for strawberries to have them in salad too. And with feta. BUT never with bacon. Duh—that’s an obvious delicious choice! Strawberries and blue cheese- one of my favs! This salad is amazing!!!! Bonkers gorgeous! Bacon and strawberries sound strange.. when I think about it, it is unusual combination, but it should taste nice together! I’m jealous that you still have strawberries left to pick where you are! I want to dive right into this salad because it includes all of my favorite toppings. Perfect for lunch! Feta is da bomb on a salad! Sounds like a wonderful salad. Recently I discovered how good strawberries can be in savory dishes. Though I used fruits before in various salads never used strawberries in salads or meat dishes. It’s an amazing combination. That looks delicious! Love all of the flavors in here. Love all the sweet and savory components going on here!! WHAT a salad! Beautiful salad…love feta on a salad!